Is Veggie Pirate's Booty a Healthy Snack or Junk Food? When you see "Veggie" in the title, you want it to be a healthy snack! Hey, I'm eating my veggies, mom! Alas, just because it says "veggie" doesn't mean it comes with the same healthy benefits of kale chips. Veggie Pirate's Booty DOES come with "Kale Powder" which is listed on its ingredients list. I was wondering if you could review Pirate's Booty? I imagine it is not very healthy, as it is very delicious. I enjoy reading your blog. I have a 5, 3, and 1 year-old, and I hate packing lunches. We all love fruit, and it is our saving grace. The only other things I can say we all love is pizza and ice cream. I am always looking for healthy, good-tasting things for us to eat. There are lots of obstacles. To mention two, my kids hate vegetables (except corn), and I also hate cooking. I do love to exercise, though, if that counts for anything. 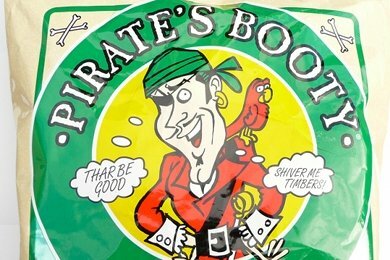 Pirate's Booty is definitely not made with a vegetable, it is made with a grains - corn and rice. I believe Pirate's Booty was developed because little kids don't eat popcorn because of the choking risk. I am a BIG advocate for popcorn because it is whole grain, crunchy, and low in calorie (Homemade Microwave Popcorn). Parents are told not to give kids popcorn until they are 4 years old. Pirate's Booty just melts in your mouth like the Gerber's Puffs. And it has a great name and silly phrases such as "shiver me timbers!" on the package. But is it healthy? A good comparison for Pirate's Booty is to Cheetos because they are made with corn meal too! I think Pirate's Booty is better than Cheetos because it doesn't have all those artificial colors and MSG. Cheetos has 250 mg of sodium per serving and Pirate's Booty has 120 mg. Compare Pirate's Booty to actual vegetables and you have no contest. Fresh veggies are going to win every time! They have so many more vitamins, minerals, grams of protein and fiber, etc. All you have to do is read Pirate's Booty's label - Vitamin A 0%, Vitamin C 0%, Calcium 0%, Iron 2% - and realize that this is no better than most junk food. Yes, I am calling it junk food. My suggestion is to make Pirate's Booty a sometimes treat and at $3 per 4 ounces or skip it and make your own popcorn (which is far cheaper). For a sweet spin on popcorn try my chocolate drizzled popcorn or white chocolate popcorn. If you are looking for savory – try my chili lime popcorn recipe. What do you think of Pirate's Booty? I just saw those for the first time yesterday. They were in the healthy food aisle, ha. Health food? No. Better for you than Cheetos? Yes. You can eat an entire 4 oz bag of White Cheddar Booty for about 520 calories, 20 g fat, 560 mg sodium. The same size bag of Cheetos will run you about 640 cal, 40 g fat, 1160(!!) mg sodium. So it's not healthy, of course not - it's a processed snack. But if you are craving salty cheesy cruchy deliciousness and you don't want to make your own homemade cheese popcorn, it's a better choice than most others. I figured. I use Pirate's Booty as a chip-replacement. We keep trying veggies, but they want none of it. They do love fruit, so I'll take what I can get. And guess what they discovered at the grocery store sample-table Sunday? Nutella. Naturally, they looooved it. And why not? Ingredient #1...SUGAR! So, we are using it as dessert, and everyone is happy. It's easy to mistake "healthy" junk food for healty food. When you want some junk, turn to the healthy options. But don't forget to eat real food too! Thanks for your review. As for popcorn - popping it on the stove yourself is super healthy and takes just as much time as the microwave kind! ugh. I read it. now I am sad. it is so delicious. of course it is fake. We use Booty as a chip replacement here too. No, it's not health food. I would put it in the junk food category. But for my daughter who LOVES it, who eats more than double the amount of fruits and veggies she is "recommended" to have in a day, I am just perfectly fine with her snacking on it once in awhile. A serving size of Booty is TWO CUPS. She gets, at most, 1/2 cup, so 1/4 of a serving size, at a time. That's not something I'm going to fret over one little bit. And, if I'm not mistaken, "Veggie Booty" DOES have vegetables in it - veggie powder - as flavoring. They are not referring to the corn base. Regular Booty is cheddar flavored, Veggie Booty has spinach powder and other natural flavorings in it. Same as "Veggie Sticks" and "Veggie Chips". Which I totally put in the same category as Pirate Booty.